Rated 5 out of 5 by ApolloProServices from Very Powerful Machine Great Pressure Washer, good design and great looks. 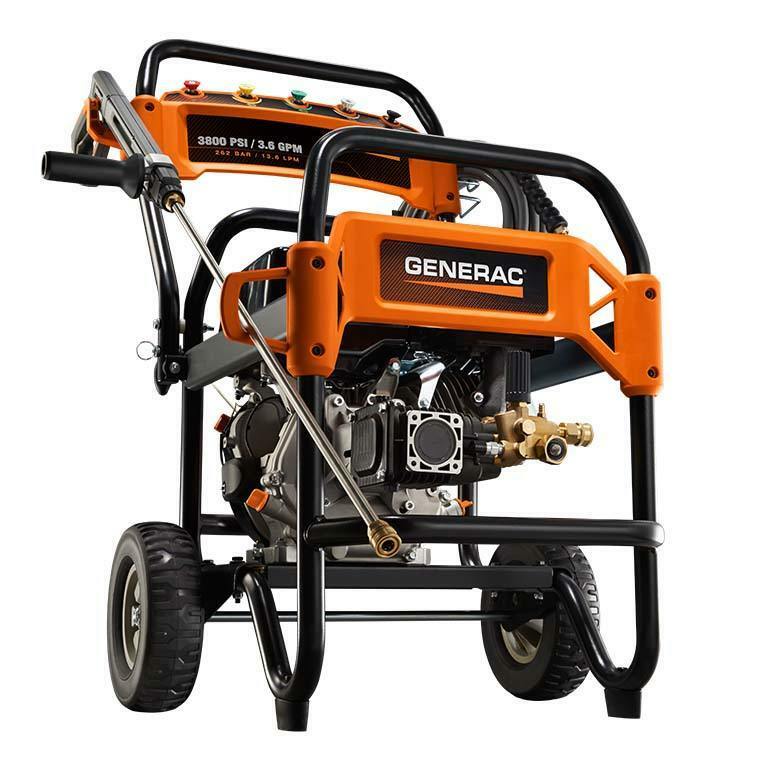 This is my 4th Generac Pressure Washer for my business. The brand and appearance makes my company look very professional. They all clean very well. Great customer service, any problems or questions are handled quickly. I would definitely recommend Generac products to everyone I know! Rated 5 out of 5 by 1lakejunkie from This product works great as expected I purchased this model to start my own pressure washing business this summer! I chose this model because you get the most bang for your buck! Other models were way more expensive with nothing more to offer! Plus, you can't beat the Generac Gaurantee!!! Thanks Generac!! Rated 4 out of 5 by Jeff from Solid Machine for bigger jobs Had machine for ~ 3 months at time of review; usage is general home care. Great power for home use, 3.8 GPM helps keep large amounts of material moving. 35 foot hose is nice, a 50 foot house would be perfect. Wish that the unit had a more significant muffler; it's quite loud and you really need ear protection for anything other than short usages. Your neighbors know this is running. Also, it be nice if packaging was a bit more compact - frame provides protection but also makes it big overall. Fold down handle helps. Unit starts reasonably well - key is to be sure to relieve the line pressure after a few pulls. Adjust the above and it gets 5 stars. Rated 5 out of 5 by Tshep from Excellent machine I got this machine about a year ago after my previous washer of some 10 years - a 2700 psi unit - was beginning to die. And I have not regretted it. The engine starts at the first pull...usually. Once or twice for some reason it required about 5 attempts, but usually it's just one or two. And the washer has serious muscle, making light work of any cleaning job - at least the ones I've had. About the only thing I think would improve this unit is provision for battery starting. It's a fairly big engine and if you have a hard start and end up having to pull it 5 or 6 times (rare), your hemoglobin starts to drop! The other small critique is that operating the trigger can tire a thinly muscled person rapidly. I've had to come up with some creative ways to keep the trigger pulled in for long jobs (lasting 4 or 5 hours). Overall, it's worth every cent. I heartily recommend it. 3800PSI Commercial 6564 is rated 4.8 out of 5 by 4.